Joseph Trafton is in his inaugural season as Music Director of the Hagen Philharmonic Orchestra, where he conducts numerous symphony concerts and operas. He also made his Czech debut in August 2017 at the Ostrava Days Festival, conducting concerts as well as Miroslav Srnka’s opera “Make No Noise.” In September 2016 he made his debut in France conducting at the Festival Musica Strasbourg with a diverse program including the world premiere of Verästelungen by Michael Jarrell. As 1st Kapellmeister at the Nationaltheater Mannheim for five years, he conducted over 300 performances encompassing an vast range of repertoire. New productions included the world premiere of Bernhard Lang’s Der Golem, Donizetti’s Lucia di Lammermoor, Britten’s The Turn of the Screw, Schumann’s Scenes from Goethe’s Faust. In Mannheim he also conducted numerous revivals, such as Madama Butterfly, Don Carlo, Carmen, Der Freischütz, La Nozze di Figaro, La Traviata, La Bohéme, Die Fledermaus and Turandot and many others. In addition, he has led ballet productions including Prokofiev’s Romeo and Juliet, Isadora, Othello, Rilke as well as numerous family concerts including Stravinsky’s Firebird Suite, Dvorak’s New World Symphony, Mussorgsky’s Pictures at an Exhibition, Beethoven’s Eroica Symphony, Britten’s Young Person’s Guide to the Orchestra, and Dukas’ The Sorceror’s Apprentice. A composer himself and advocate of new music, he has conducted numerous world premieres, including the upcoming Violin Concerto by Wolfram Schurig and Siegel und Idee by Patrick Frank. For the Schwetzinger Festival he was involved in a video production and world premiere of Lang’s opera Rei:gen. Other projects include revivals of recent operas by Olga Neuwirth, Bernhard Lang, and Mieczyslaw Weinberg. For ballet, he has conducted music by John Adams, Alban Berg, Philip Glass, Charles Ives, Aaron Jay Kernis, Nico Muhly, Kaija Saariaho, and Anton Webern. At the other end of the spectrum, he has a passion for Baroque and Classical music, and studied historic performance practice with Paul O’Dette and Malcolm Bilson. He has also collaborated with early music specialists Reinhard Goebel and Emmanuelle Haïm. 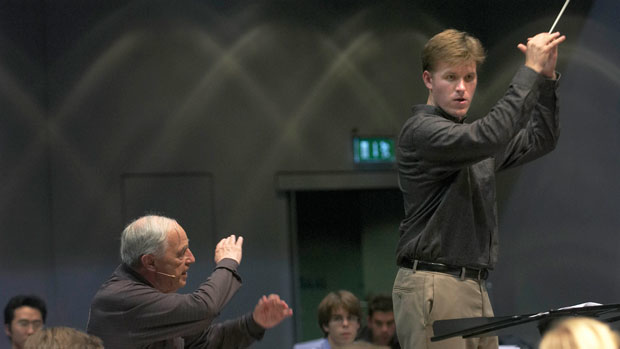 Recent guest conducting appearances include Tschaikovsky’s Eugen Onegin at Theater Basel, Switzerland,Verdi’s Il Trovatore at the Staatstheater Oldenburg, and Die Lustige Witwe at the Theater Ulm, as well as concerts with the PHACE Ensemble in Vienna, Baden-Baden Philharmonic Orchestra and Kammerphilharmonie Ascania. He previously held Kapellmeister positions at the Staatstheater Braunschweig and Theater Regensburg, where he conducted new productions of Ayers’ The Cricket Recovers (2005), Frid’s The Diary of Anne Frank, Jesus Christ Superstar, the ballet Carmen, and numerous repertoire performances including Die Zauberflöte, Fidelio, Der fleigender Holländer, Cavalleria Rusticana, Pagliacci, and The Nutcracker. In his various positions he piloted many community outreach and youth projects. For the Prague Arts Festival in Regensburg, he created and conducted an interactive orchestra project in which the audience read graphic notation and played percussion instruments in response to conducting gestures. In Braunschweig he was music director for and actor in the children’s opera productions Westzeitstory by Juliane Klein, a baroque opera pastiche Schaf, and a commissioned project of a rock/latin version of Bizet’s Carmen. He also conducted Antheil’s Sixth Symphony in a multimedia concert for high school students. Trafton also served as Music Director of the University of Passau Student Orchester, where he conducted Dvorak’s Cello Concerto, as well as works by Bruch, Brahms, Schubert, and Sibelius, to critical acclaim. Born in Bowling Green, Kentucky in 1978, Joseph Trafton studied Composition, Conducting, and Piano at the University of Miami. In 1998 he received a scholarship to study at Vienna’s Universität für Musik. While in Vienna he was invited to conduct at the open-air festival in Schwäbisch Hall, Germany, and made his European conducting debut at the age of 21 with van Dijk’s Cyrano. He returned to America to study conducting at the Eastman School of Music, receiving his Master’s degree in 2002. He has also studied at the Pierre Monteux School for Conductors and the Aspen Music Festival and School. In 2005 he was one of four active participants invited by Pierre Boulez to study at a summer conducting course in Lucerne, Switzerland. He also participated actively in masterclasses in Lucerne with Bernard Haitink.